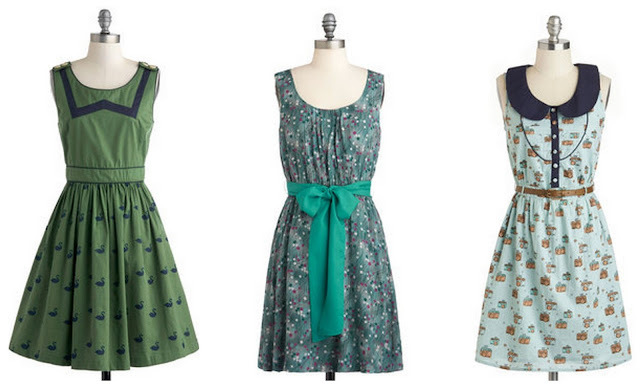 If you have been living under a rock and just discovered the internet, then you have to visit ModCloth! Spring is upon us, well at least warm weather should be here soon and what better time to get some pretty spring outfits, or in my case dresses! That last dress on the right is way to cute! I love all the super cute cameras on it! I love to scroll through all their cute items and drool. I still have a ModCloth dress in my closet that I need to do an outfit post with, I've just been waiting for some nice weather to come along! They pretty much have everything now too. From your apartment to even wedding accessories and beautiful vintage finds. They are almost a one stop shop. I totally dig that they carry Hello Kitty items. You all know how obsessed I am with HK. What do you love from ModCloth? I know I have a long list! You can click on the banner below to see all their new arrivals & sales! Any whooooo, I hope you all having a great so far. As for me, I battled a little bit of a tummy virus which was not fun. I'm all better now and just in time for a fully packed weekend full of awesome Easter fun. Tomorrow we will be dying eggs and making Easter Baskets. Sunday we will be a family reunion/Easter picnic, and then on Monday we will be in Baltimore, and then Washinton DC for vacation. I can't wait!! !